Amazing Grace Sign Scroll Saw Pattern. 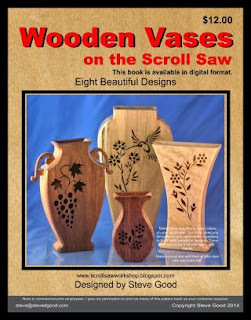 If you would like to have all the patterns in the Scrollsaw Workshop catalog you can buy the first six years DVD and the 2013, 2014 update DVDs at this link. DVD #1 is $20 and contains over 1,100 patterns. The 2013 update DVD is $7.50 and has another 178 patterns. DVD update 2014 has 223 patterns. Sue Mey is again sponsoring our giveaway. She has offered a $35 gift certificate that can be used on her website. I will put up a $25 gift certificate from Amazon.com for the second place winner. Here are the rules for this months giveaway. Don't follow the rules exactly and you will not win. At the top of the page there is a menu titled "Pattern Tutorials". Open that menu. Sue has 6 tutorials listed on that page for making patterns. Each tutorial image shows an animal. In the subject type the animal shown in the tutorials. Entries have to be received by Saturday January 31st 2015. Midnight Eastern time U.S. The winners with the correct answer will be drawn at random. Below is a note from Sue with her current special offers. Instead of buying another Valentines Day card this year make one of Sues plaques for your Valentine. Once again I have made a set of plaques - for Valentine's Day, observed on February 14 in many countries around the world. Valentines is all about love, hearts and roses, and all these symbols are featured in the patterns. Cut the designs using 1/2" to 1" (12mm to 25mm) for a substantial plaque project. Alternatively they can be cut from 1/8" (3mm) wood. Drill blade entry holes and make the inside cuts of the designs. Use small pieces of thin double-sided tape in a few places to attach the work piece on top of the wood for the backer. Cut the scalloped perimeter line of the pattern through both layers of wood. Detach the work pieces, remove the double-sided tape, and sand them by hand. For overlays made from birch plywood, add a darker wood (or painted backer), to accentuate the designs. Complete the project by gluing the overlay on top of the backer. Attach a saw tooth hanger to the back. Instead of using it as a wall hanging, the plaque can also be displayed on a stand. I am offering this set at a 25% discount as seen below, (added to Special Offers) but they are also available as single patterns. Visit the Special Offers category for my e-Magazines. There are also pattern sets at reduced prices and a great deal on seven digital books: 40 Christian crosses, 44 Christmas projects, 40 Boxes, 46 Angel-themed projects, 50 Signs & Plaques, 50 Clocks and 40 Love & friends patterns. Patterns purchased from my website are conveniently delivered as downloads to your computer for immediate printing and use. All patterns are available in vector format on request.